Unfortunately, the video embedded in that link won't play for me. That's the 3rd or 4th time in the last couple of days that's happened. Wonder if it has anything to do with all the Facebook fallout? Maybe people turning off the features that allow others to play videos? Anyway, judging by the still photos, Spots is an Appaloosa. Or, if he's on the small side, maybe a Pony of the Americas? BaroqueAgain1 wrote: Unfortunately, the video embedded in that link won't play for me. That's the 3rd or 4th time in the last couple of days that's happened. Wonder if it has anything to do with all the Facebook fallout? Maybe people turning off the features that allow others to play videos? Mr. Spots is way too big to be POA, he's probably just regular Appy, a handsome leopard fellow. The message I see is that you have to be logged in to FB to continue (I'm not on FB)... c'est la vie. 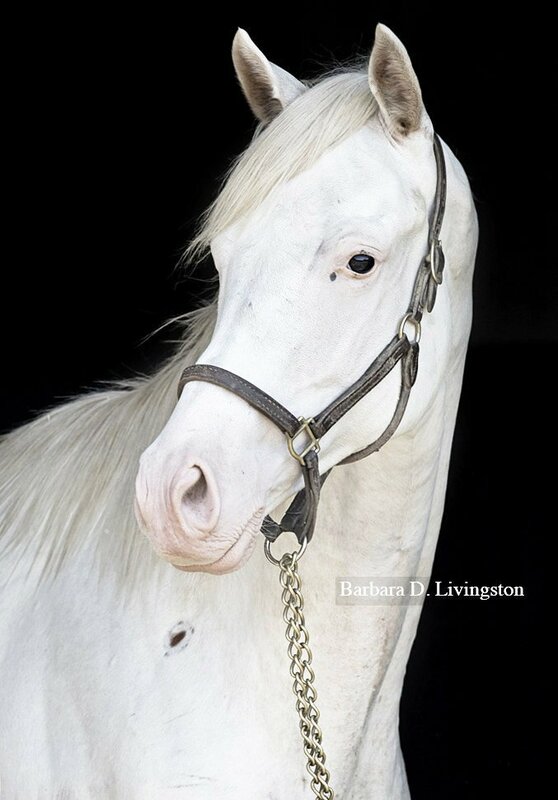 Barbara Livingston has a head shot of him on her twitter feed... hopefully somebody can get you the full body/confo shots! 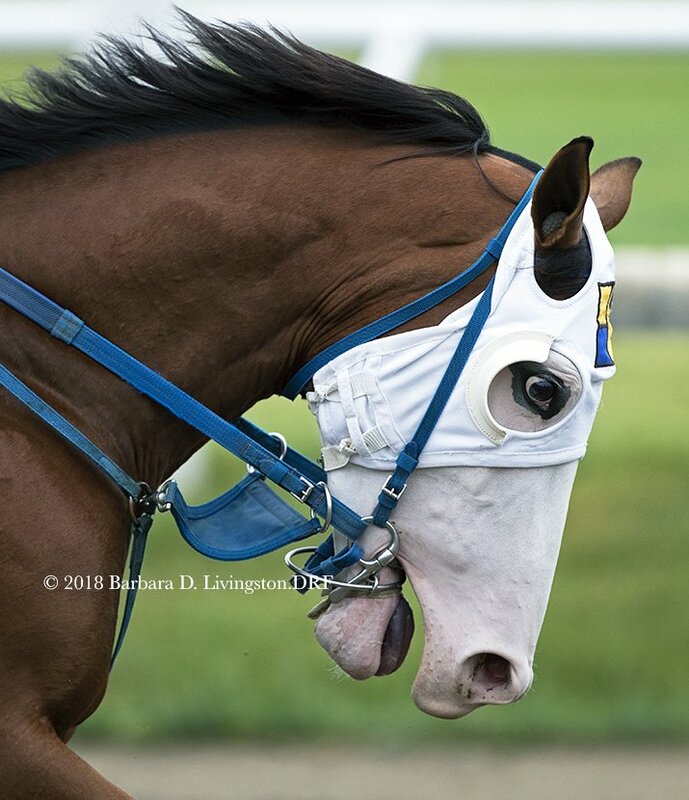 This white Thoroughbred nut (me) is rooting for the 2-year-old Honorable Dillon-Princesspatseattle colt who's selling today at @FasigTiptonCo Timonium. Long before he was hip 441, he was an adorable foal and then an eye-catching yearling at @rockridgestud . Sold for $7k to A. ROGERS SMITHWICK. FlyToTheStars wrote: what was the price? He's been working since the end of April. And now for something completely different.... Unraced 2yo colt SOUTHERN PHANTOM, bred by Southern Equine Stables, galloping at Saratoga yesterday. The unusual son of Bodemeister-Out for Revenge, by Bernardini, is trained by Eric Guillot. I don't think this is the first time I've seen a Bodemeister with really flashy white markings. He must have some interesting genes back in his pedigree. 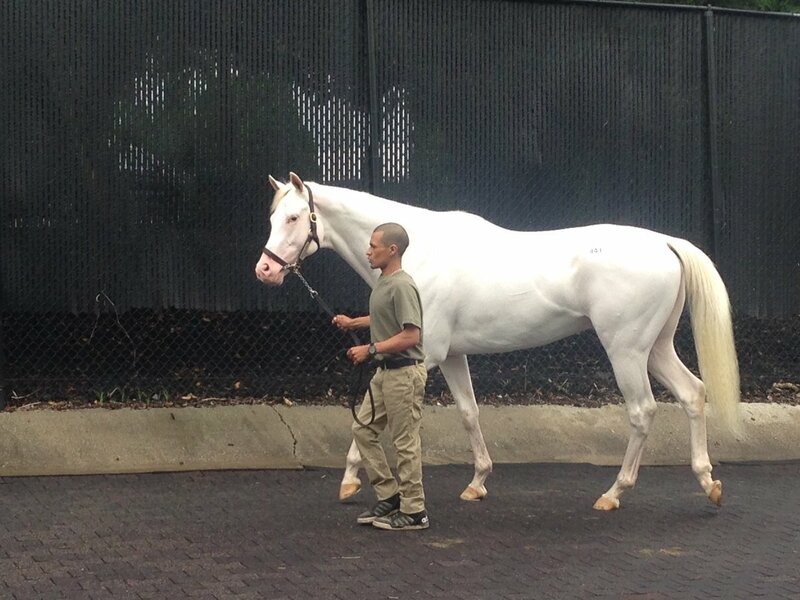 BaroqueAgain1 wrote: I don't think this is the first time I've seen a Bodemeister with really flashy white markings. He must have some interesting genes back in his pedigree. Even stranger is that he is out of a Bernardini mare lol. When was the last time you saw a Bernardini with lots of chrome? I remember seeing his baby photos! The link for his naming contest was posted on this here forum... I can't believe he is 2 years old already!? Not the greatest photo though his tongue is going blue. I am looking forward to seeing him race. By the way weirdly enough I think it might be something in Empire Maker. 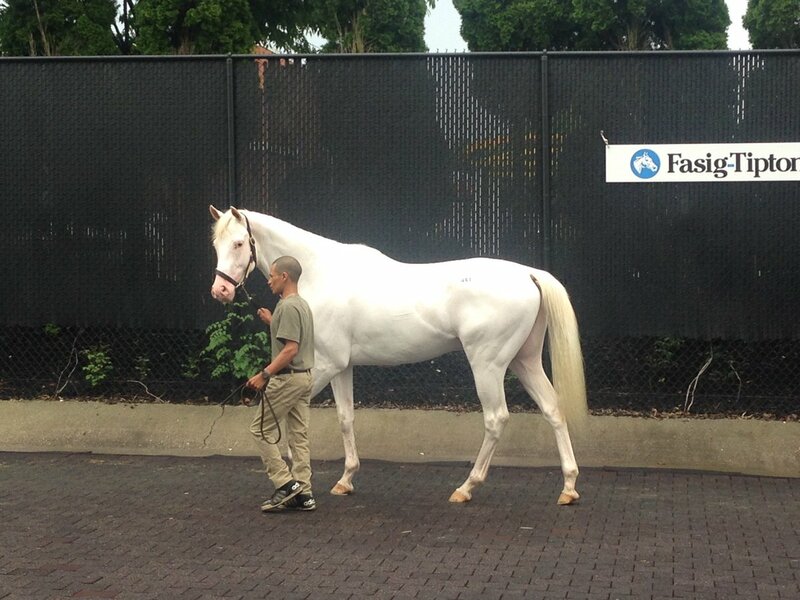 I seem to recall PotN throws a fair bit of white too although maybe not quite as expansive as Bodemeister. I recall people commenting Pharoah seemed to be one of the exceptions white-wise. Barbara Livingston posted some more pictures of him. This colt is bred in the purple. Its coming from his sire. Unbridled, Storm Cat, A.P. Indy, Northern Dancer, etc. Which leads me to wonder if we are getting more loudly colored horses because of the amount of inbreeding in the population? Doubling up on horses who are known to have a lot of white in their lines? Interesting there are no new pictures of his other side. They always show the side with the eyeliner and brown eye. His other side he has no eyeliner and a blue eye.